The official patch notes are below; further details about the new restrictions on sending gil can be seen here. A new form of Conflict called "Brenner" is now available. - Some command messages have been changed due to the institution of Brenner. You may view command messages by typing /?. Several new quests have been added, including a new battle against the avatars and an event unfolding over several Chains of Promathia areas. Now when you talk to a guard about supply quests, the regions that you have already delivered supplies to will be marked with "(Done)." The quests are still repeatable if you have fulfilled the requirements for participation. However, changing your nationality will reset your progress record, and you will no longer be able to use regional teleportation. In order to utilize the teleportation service once again, you must receive and complete the supply quests from a guard in your new nation. The chocobo fares in San d'Oria, Bastok, Windurst, Jeuno, and the crags of Holla, Dem, and Mea will drop more rapidly than before the version update. An issue in which a Fellow NPC's TP would fall to 0 upon gaining a level has been corrected. An issue in which a Fellow NPC would equip the same weapon after receiving a "Quarterstaff" or a "Holly Pole" has been corrected. Certain Fellow NPC abilities have been strengthened. The NPC Sagheera now has additional items available in exchange for ancient beastcoins. The new area "Dynamis - Tavnazia" is now available for exploration. You may enter Dynamis - Tavnazia with up to 18 people, but only after completing the areas Dynamis � Valkurm, Dynamis � Buburimu, and Dynamis � Qufim. Players can remain in the area for 15 minutes and will be unable to access support job abilities. However, players can extend the time allowed in the area and regain support job abilities by fulfilling certain conditions. Once you have entered Dynamis � Tavnazia, you will be unable to enter any area of Dynamis for a period of 3 days (Earth time). *Players who have not installed the Rise of the Zilart or Chains of Promathia expansion discs, or who have not registered the expansion content, will be unable to enter Dynamis - Tavnazia. -The storyline for Dynamis � Buburimu, Dynamis � Valkurm, and Dynamis � Qufim is now complete. -Certain relics and damaged relic armor have been added that are only available in Dynamis � Tavnazia. *Ancient currency that players could earn in previously released Dynamis areas will also be available in Dynamis - Tavnazia. *Damaged relic armor can only be found in Dynamis � Valkurm, Dynamis � Buburimu, Dynamis � Qufim, and Dynamis - Tavnazia. New routes have been added to the two areas of Limbus - Temenos and Apollyon. Certain requirements must be fulfilled in order to enter Temenos and Apollyon. Certain wyrms' resistance against sleep has been increased. However, wyrms that appear in missions and story events will be unaffected by this change. Several new key items are available in exchange for guild points. An issue where the �shinobi hakama� could not be desynthesized with the weaving skill has been corrected. The stack number for the following items has been increased from 12 to 99. *The inviting party can also choose items from the 40-day list at the 100-day mark. *Characters cannot obtain items that specify another race or gender. For further details on the Vana�diel Adventurer Recruitment Program (V.A.R.P. ), please refer to the sites below. Click on the Vana�diel Adventurer Recruitment Program banner under the menu. The special event item storage NPC will now accept the following additional items: dream robe, dream robe +1, and charm wand +1. *Please note that stored items will lose their signatures. - Any block of time up to 2 days after the reservation date can now be reserved. - It is now possible to set participation requirements when making a reservation. - By selecting the �Recruiting Members� option during the reservation process, prospective participants will now receive a page of the Ballista Redbook from Tillecoe. In a previous update, damage taken during Conflict (PvP) by melee, ranged, and magic attacks was adjusted to an amount relatively lower than damage taken in regular battles with monsters. With this month�s version update, damage taken by techniques that hit multiple times has been adjusted in the same manner. This modification applies to job traits and weapon skills that allow the player to land consecutive hits (e.g., Double Attack, Triple Attack, Rampage). The distance detection for auto-attack will now function correctly for PCs who have been the target of �Provoke� in a Conflict match. Menu shading has been adjusted. The terms "Dynamis - Tavnazia" and "Abdhaljs Isle-Purgonorgo" have been added to the auto-translate function. The maximum amount of money that can be sent at one time has now been set to 1 million gil. Gil can now only be placed in one of the 8 delivery slots. *No restrictions apply to receiving gil. A message describing the transaction will now be displayed when buying or selling items at a shop. Further adjustments were made to compensate for the inconsistency in fishing difficulty experienced by different clients. In the case where a fish registered for Fish Ranking didn�t make the cutoff point, or was pushed out of the ranking by another registered fish, the NPC Chenon would respond to registration enquiries with �You currently have no entries registered for Fish Ranking.� This issue has now been corrected. A �Pattern D� has been added to the FINAL FANTASY XI Gamepad Config program. FINAL FANTASY XI is now compatible with Intel Viiv technology. When using the Windows XP Media Center Edition 2005 operating system, it is possible to start FINAL FANTASY XI from the shortcut located in the �More Programs� menu. *This does not guarantee that FINAL FANTASY XI will run on a Windows PC installed with Intel Viiv technology. The user interface has been increased in scale for HDTV displays. It is now possible to enter numbers from the numeric keypad when using a USB keyboard. The scheduled recipe change for �Tavnazian tacos� mentioned in the February 2nd, 2006 Topics (FINAL FANTASY XI official homepage) will now take place in a later version update. A handful of updates are here, in preparation for the patch this evening. As always, we will be compiling the information from the patch and presenting it for easy perusal, with the initial information presented a few hours after the patch is available. An update for FINAL FANTASY XI is currently scheduled for Feb. 20, 2006. Approximate file sizes and installation times for this update are shown below. * Several downloadable files may be skipped during or after the version update. However this will not affect the installation process after the download ends. At the following time, we will be performing a version update of the PlayOnline Viewer. *The following updates are for the PlayStation 2 and Windows versions only. They are not reflected in the Xbox 360 version. - Modifications will be made to accommodate Intel Viiv technology. - Other minor issues will be addressed. *For the update details, please refer to "Topics" on the official PlayOnline.com web site (http://www.playonline.com/) which will be available on Feb. 20, 2006. During the Feb. 20 maintenance, stack number for items listed below will increase from 12 to 99. To prepare for this change, the auction of these items will be restricted starting Feb. 18 at 1:00 (PST) until Feb. 20 (the duration of the maintenance period). Players will still be able to bid on items already up for auction. Players will also be able to remove these items from auction if they desire. * All other items will be unaffected. * Please refer to the "All Worlds Maintenance (Feb. 20)" article for the details regarding the Feb. 20 maintenance. The stack number for several items will increase from 12 to 99, and these items will be restricted on the auction house for Feb. 20 maintenance preparation. In addition to the items that have been announced in the earlier news article, stack number for the following items will increase from 12 to 99. Since the end of last year, item values have risen astronomically on all Worlds due to the manipulation of prices by a small percentage of the player base. The development team and the GMs carried out a detailed investigation of this problem, and discovered the existence of a group using illicit methods to produce large amounts of gil that are later sold in the real world (Real Money Trading). We would like to take this opportunity to outline the measures that have been taken to correct this issue. Based on the results of this investigation, more than 700 accounts among those found to be involved in large-scale RMT operations have been terminated. We will continue to monitor accounts suspected of dealing in gil created or obtained in an unfair manner. Thanks to these measures, more than 300 billion gil has been removed from circulation, and the overly inflated prices of items have begun to fall to more realistic levels. Furthermore, emergency maintenance has already been performed on all worlds for the purpose of implementing RMT countermeasures. This maintenance took place over two stages, starting on January 17th. In addition to bringing you news on the February version update, we are happy to announce the latest information regarding the Xbox 360 Beta and the commencement of official service. In addition to the February version update content being implemented across all platforms, Xbox 360 Beta users will be receiving a specific Xbox 360-related update. -The user interface will be increased in scale by approximately 20% to compensate for small characters on some HDTV displays. Standard TV displays will not be affected. -It will now be possible to enter numbers from the numeric keypad when using a USB keyboard. This change will not affect game controls that already utilize the numeric keypad. The Hydra world is the stage for the Xbox 360 Beta and is currently home to many thousands of players from Japan, North America, and Europe. With the number of simultaneous logins exceeding the public worlds, the strong North American and European presence can be seen in the peak login time that begins in Japan's morning and stretches into the afternoon. As was previously announced, the sale and official commencement of service for the Xbox 360 version of FINAL FANTASY XI will coincide with the release date of the upcoming expansion disc, Treasures of Aht Urhgan. All three expansion discs-Rise of the Zilart, Chains of Promathia, and Treasures of Aht Urhgan-will be included in the release version of FINAL FANTASY XI for the Xbox 360. As the date for official service looms nearer, the development team is looking into the possibility of transferring character data to the public servers for all players currently enjoying the Xbox 360 Beta. As the beta testing continues, however, technical issues may arise that could prevent such a transfer. We will be sure to bring you updates on this matter as soon as they are available. We would like to remind players that it is possible to make an Xbox 360 Beta character using an existing PlayOnline account for Windows or the PlayStation 2. A FINAL FANTASY XI character made with a PlayOnline Beta account for the Xbox 360 cannot be transferred to an existing account on a different platform. A range of site interface updates are found in this site update. A new Quests / Missions / Events section was added to all the zone pages. This displays information on which quests, missions, and mini-quests use or start in a specific zone. Examples can be seen in Bastok Markets and Garlaige Citadel. To prevent confusion for new site users, equipment items that cannot be sold on the Auction House are no longer listed with an Auction House Category. Instead, that field is displayed as Equipment Category on items that are Exclusive or Not Auction House Sellable. Examples can be seen on the Carpenter's Gloves and Joyeuse. Various minor tweaks were made to the quest display. The Furniture and Moghancement Guide was updated to include all the furniture items from the last few patches, and corrections to the stats of a handful of furniture items. Valentione's Day Event is Here! The full walkthrough for the Valentine's Day event (called "Valentione's Day" in Vana'diel) is now available; post any comments or further details in the related forum topic. Enjoy! To everything there is a season, and the time to tell that special someone how you feel is drawing near. Valentione's Day will soon be upon Vana'diel once again! Valentione's Day commemorates the story of a courageous squire named Valentione, who fell in love with a noblewoman regardless of their gap in social status. He confessed his love in the form of a gift, and succeeded in stealing her heart. On Valentione's Day, the inhabitants of Vana'diel show their feelings by giving the person they care about a present, such as chocolate. That's why that person is special, right? But it takes a lot of courage to take it to the next level! And that's where the moogles come in to help! They have devised a plan to bring eligible bachelors and bachelorettes of the three major nations together. Not only that, but they even claim that their fantabulous, splenderrific event (the moogle head planner's exact words) will help adventurers come together, too! If you've ever wanted to try your hand at playing Cupid, you will get your chance soon! One last word from the Mog House Management Union (M.H.M.U. ): "We're waiting for you all with wonderful prizes that will let you show your love forever and ever, kupo!" This event is scheduled to commence on February 2, 2006 at 16:00, and will last until February 15, 2006 at 0:00 (PST). An issue where players are unable to obtain "Twilight Crystal" from the Valentione's Day's prize has been confirmed. When players select "Twilight Crystal" for the prize, moogle instead hands out an "Aurora Crystal." Please be very careful not to select "Twilight Crystal" if you do not want "Aurora Crystal" as a prize. Aly's Escapades Day 9 - Happy New Year! Treasures of Aht Urhgan Release Date Announced! Treasures of Aht Urhgan - Latest News! The Treasures of Aht Urhgan website has been updated with all-new information, and the launch date is April 18, 2006! Learn about the exciting new Corsair job, and check out the additional entries for gruesome and dangerous monsters in the Adversaries section. You can also find information on the locations that will become the stage for your adventures in the Near East--the Empire of Aht Urhgan and the Imperial City of Al Zahbi. Dynamis - Tavnazia and More! The area of Dynamis - Tavnazia, as well as a new route for both Temenos and Apollyon, will be released in the upcoming version update. In the December update, players gained access to Dynamis - Valkurm, Dynamis - Buburimu, and Dynamis - Qufim. Now the fourth and final area in this storyline will be opened to adventurers--Dynamis - Tavnazia. As with the previous 3 areas, Dynamis - Tavnazia will present a level of difficulty that will challenge even the most seasoned adventurer. Upon entering the area, a time restriction of 15 minutes and a lock on support job abilities will be imposed. Time extensions and the recovery of support job abilities can be earned by fulfilling certain conditions. Due to an issue with the complicated topography, the maximum number of people that can enter Dynamis - Tavnazia will be restricted to 18 members. While this restriction may present obstacles that cannot be overcome by the current Dynamis strategies, we encourage players to experiment with different party compositions and battle plans. The entity that must be defeated to bring an end to this nightmare is not the same being that reigns in Dynamis - Xarcabard. Several incarnations of this NPC exist within Dynamis - Tavnazia. We leave the decision of whether the battle will be against one or more of these incarnations to the judgment and abilities of the players. - The storyline that began in Dynamis - Valkurm, Dynamis - Buburimu, and Dynamis - Qufim will reach its conclusion in Dynamis - Tavnazia. - Certain relics and damaged relic armor have been added that are exclusive to Dynamis - Tavnazia. - Ancient currency that players could earn in previously released Dynamis areas will also be available in Dynamis - Tavnazia. - New equipment has been added that is exclusive to Dynamis - Tavnazia. Dynamis - Tavnazia can only be entered after completing the areas Dynamis - Valkurm, Dynamis - Buburimu, and Dynamis - Qufim. Once you have entered Dynamis - Tavnazia, you will be unable to enter any area of Dynamis for a period of 3 days (Earth time). The Temenos and Apollyon areas of the Limbus region (released in the October update) will each be gaining a new route. In order to access these new routes, an item known as a "metal chip" will be needed in addition to the existing requirements. These metal chips can be obtained in exchange for 75 ancient beastcoins, or found during a foray into one of the Limbus areas. The main purpose of the Limbus areas is to collect ancient beastcoins, and these new routes have been designed to make it possible for players to increase their hoard of coins. This will be no easy task, however, and we leave it up to the players to decide whether or not they will risk their hard-earned beastcoins for the chance to obtain greater rewards. Dynamis - Tavnazia and the new Limbus routes await the brave and resourceful adventurer! Take a look at the exciting new content scheduled for the upcoming version update. - The Sequel to "Storms of Fate"
The quest "Storms of Fate," which brought players into direct conflict with the mighty Bahamut, was introduced in the December 2005 version update. This February, prepare for the next chapter in this epic story with a new quest to challenge the most powerful of adventurers. *The Rise of the Zilart and Chains of Promathia expansion discs must be installed and registered in order to undertake this quest. Certain storyline progression in both expansion discs is also required. Up until now, there have been other quests that allowed players to test themselves in battle against the prime avatars. In this new quest, however, the protectors of the protocrystals will be stronger than ever before, requiring adventurers to rethink old strategies. This quest will allow a maximum of 18 people to take the field against these more powerful manifestations of the avatars. Quests that hint at adventures to come, as well as many other additions, await you in the February version update. A new form of Conflict (PvP) called "Brenner" will be introduced in this month's version update. Ballista, the first form of Conflict, was designed with the Conquest in mind and pitted one nation's adventurers against another. However, it became apparent that dividing the teams by nation invariably resulted in an uneven spread of jobs, making it difficult to enjoy a casual match of Ballista. It was then that Diorama Abdhaljs-Ghelsba was created in an effort to steer Ballista away from the Conquest and focus more on the competitive nature of the matches. This new style of Ballista made it possible for players to freely travel to a reserved area from Jeuno and adjust the rules and settings of the matches as they wished. This proved to be a popular pastime for many Ballista enthusiasts. The following functions will be added to the reservation system in order to simplify the process of recruiting participants. -Any block of time can be reserved up to 2 days in advance. -By choosing the option "Recruiting Members," players who wish to participate in the match will receive a reservation item for the same time block from the NPC. * The same change will be made to the reservation system for Diorama Abdhaljs-Ghelsba. However, if the area were subject only to reservations, there would be cases where finding players to participate in a match could become a trial, as well as players who wish to participate but don't wish to be troubled by reservation procedures. To avoid these issues, there will be "Official Matches" held on a regular basis to encourage casual participation. In the same manner as Diorama Abdhaljs-Ghelsba, the schedule for Brenner will be based on Earth time. As a result, there will be occasions when Brenner match times will overlap with those of official Ballista matches (held on Vana'diel time.) In this case, it was deemed more important to have a schedule that was easier to understand, but rest assured that all efforts will be made to avoid official match time overlaps between Brenner and Ballista. In order to participate in Ballista, it is necessary to undergo the somewhat lengthy process of obtaining a Ballista License. Since participation in Brenner has no relation to allegiance or rank, there are no plans to implement a qualification quest. Although there were some requests for a one-on-one-style match, it was decided that the real potential for interesting matches in FINAL FANTASY XI lies in group combat. To that end, Brenner matches follow the Ballista style of pitting one team against another. Each side is provided with a like number of Flammen-Brenner (or flame burners), half of which are lit with Flamme (flame). Each Flammen-Brenner has a set number of HP, and must be destroyed before the Flamme within can be captured. The aim of the game is to protect your own Flamme while attempting to capture your opponents' Flamme and lighting all of your Flammen-Brenner. There is no "Gate Breach" status in Brenner. Defeating opposing players is directly connected to scoring points in Ballista; however, Brenner has been designed with defensive and offensive elements so that battles between players will occur naturally. Several elements from Ballista have been carried over into this new form of Conflict, such as temporary items, and the /sprint command. However, the overall flow of the game will be unique to Brenner. In response to the favorable feedback from Ballista Royale and the chance to play in set teams, Brenner will also include a system that allows direct competition between linkshell groups. There are no current plans to hold a linkshell tournament, but many functions that concern linkshell and other user events are under development. Check out Brenner for yourself after the February version update! The number of charges left on an enchanted item will display differently in the item description window after the February version update. 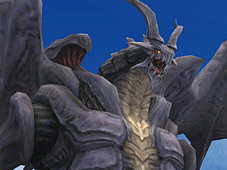 The FINAL FANTASY XI development team is continually examining measures to improve the clarity of the game's visuals, and is aware that some players buy enchanted items from bazaars without realizing how many charges are left on the item. Listening to the concerns of the players, we have decided to improve the way the number of charges left on enchanted items is displayed. The next version update will introduce the following changes to number displays in the dispensing/enchanted items description window. The color of the number of charges, the counter, recast time, and equip delay will change in the following manner. Blue = The item is fully charged. White = The item has been used (not fully charged, but some charges are left). Red = No charges are left on the item. These changes were decided based on comments received from a Japanese Premier Community site. We will continue to make announcements regarding updates and player feedback using the "Topics" section on the FINAL FANTASY XI main page and our Premier sites from around the world. In the upcoming version update, synthesis recipes will see some new additions, as well as a few alterations. Changes will also be made to the stack number of certain items. The following changes and additions will be made to synthesis recipes and items in the upcoming version update. In the previous version update, a special cooking ability was added to the key items available for purchase with guild points. Several new special synthesis skills such as this one are scheduled to make their debut in the February version update, along with all-new synthesis recipes. Let's take a look at some of the new key items and synthesis goods. An alchemy skill that allows the creation of solid medicine drops that have the same effects as their liquid equivalents. Changes will be made to the skills and items required for certain synthesis recipes. Please visit the relevant guild after the version update to find out more. The stack number for items used in the creation of arrows and bolts has been increased from 12 to 99. Several new synthesis recipes will be introduced to allow for greater quantities of these items to be created at one time, however the number created by existing recipes will remain the same. Invite Friends and Earn Items! Get more items than ever with the Vana'diel Adventurer Recruitment Program (VARP) following the next version update! Click here for a list of items that will be available, as well as information on newly storable equipment. The upcoming version update is scheduled to take place in late February. A new form of Conflict, as well as an additional area in each of the regions of Dynamis, Temenos, and Apollyon will become accessible to the adventuring population. And don't forget the usual plethora of new quests and improvements to all aspects of the game. The previously announced Treasures of Aht Urhgan expansion disc and the Xbox 360 Beta Test are both progressing on schedule. Keep an eye out for the latest developments!